The festive season can be a happy and joyful time but it can also be a period when unruly staff behaviour can ruin careers and damage working and business relationships. The Christmas and New Year period are notorious for employee related incidents that can have a major detrimental impact on an organisation no matter what size or configuration. The typical issues are sexual harassment, fighting, drink driving, bullying (abusing work colleagues and Management) and the use of banned substances. For some reason the annual Christmas party can bring out the worst behaviour in otherwise good employees. The good news is that with some foresight and leadership a lot of potential problems can be avoided. “While the organisation welcomes you to the annual Christmas party you are reminded that all attendees are required to abide by normal acceptable social and legal conventions and laws including applicable Company Policies. This includes your treatment of other staff and your behaviour in general, and while the organisation is supplying some alcoholic beverages, it is your responsibility to ensure that you drink and drive responsibly and that you remain within legal limits. If you are supplying alcohol on your premises it is important to make sure that you are not breaching your own internal policies and that all staff are made aware of the logistics of the function and their responsibilities. Especially in relation to leaving the function and any arrangements to get home safely. Some employers provide Taxi vouchers or provide alternative transport for employees. If transport is provided it should be to the employees’ home, not to another venue where more alcohol can be consumed as this can actually contribute to the risk against the employer. One of the most common behavioural problems arises where employees, after consuming large quantities of alcohol, decide to tell their boss or colleague at a Christmas function what they really think of them and/or the organisation. This sort of behaviour should be discouraged and staff advised that the Christmas function is one of celebration not aggravation. If you decide to have a Secret Santa gift purchasing scheme in place make sure that all participants are clearly advised that all gifts must be appropriate and socially acceptable, this means specifically no sexually explicit items. In large organisations it is recommended to advise all sections that if they wish to allow staff to participate in one of these Secret Santa schemes that no inappropriate gifts are to be included and that any breaches will be dealt with through the normal disciplinary process. All internal policies should contain references to alcohol and other drugs so that staff understand what substances are allowed and the conditions of their use. The term recreational drugs is a misnomer because almost all of these substances are illegal and the use and distribution of some of these substances can carry criminal charges. Failure to have in place appropriate and specific policies in relation to alcohol and other drugs in the workplace, and bullying and harassment, can significantly reduce an employer’s defence if an incident occurs and a claim arises during or following a Christmas function. Parties in Strip Clubs or the use of adult entertainment are at the highest scale of the risk table and should be avoided. Consideration also needs to be given to the timing and location of the function and to whether or not it should be held during work hours (long lunch) or after hours. Each option has its own strengths and weaknesses, but generally it is counterproductive to have staff return from a long and hearty Christmas lunch and expect them to complete the day in the most efficient and best possible way. 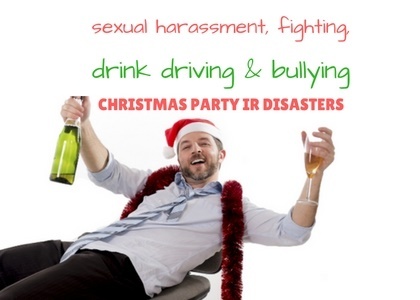 There have been many successful cases against companies who do not take reasonable steps to ensure that their employees and families are not put in harm’s way during Christmas celebrations and a few simple steps as outlined above will greatly assist in ensuring you have a trouble free party. There is no reason why Christmas parties cannot be an enjoyable end to a hard year’s work and a deserved reward for staff as long as some simple guidelines to minimise bad behaviour are applied. The most effective way to ensure success is to plan for the event and foster an atmosphere of professionalism and to promote the end of year function as a reward and celebration for a year of hard work and commitment by all. It is not possible to remove all risks but following this advice will allow a fresh start to the New Year as opposed to meetings with lawyers or a trip to the Anti-Discrimination Tribunal Fair Work Commission or Workers Compensation Tribunal.